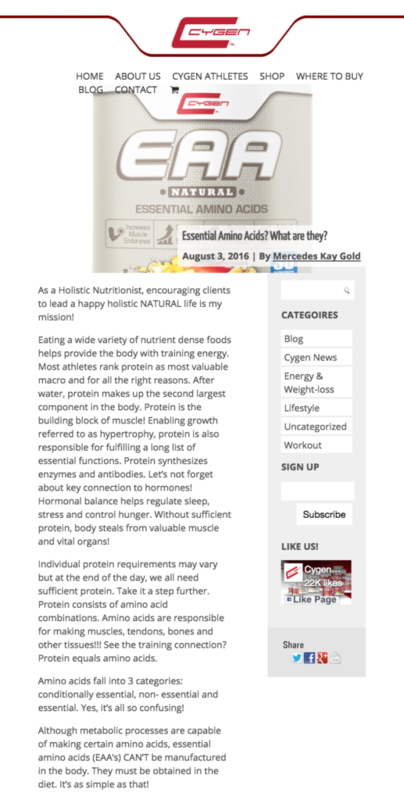 CYGEN LABS August 2016: Essential Amino Acids? What are they? As a Holistic Nutritionist, encouraging clients to lead a happy holistic NATURAL life is my mission! 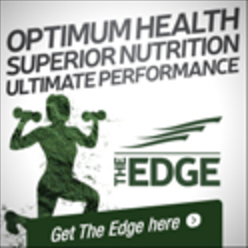 Eating a wide variety of nutrient dense foods helps provide the body with training energy. Most athletes rank protein as most valuable macro and for all the right reasons. After water, protein makes up the second largest component in the body. Protein is the building block of muscle! Enabling growth referred to as hypertrophy, protein is also responsible for fulfilling a long list of essential functions. Protein synthesizes enzymes and antibodies. Let’s not forget about key connection to hormones! Hormonal balance helps regulate sleep, stress and control hunger. Without sufficient protein, body steals from valuable muscle and vital organs! Individual protein requirements may vary but at the end of the day, we all need sufficient protein. Take it a step further. Protein consists of amino acid combinations. Amino acids are responsible for making muscles, tendons, bones and other tissues!!! See the training connection? Protein equals amino acids. 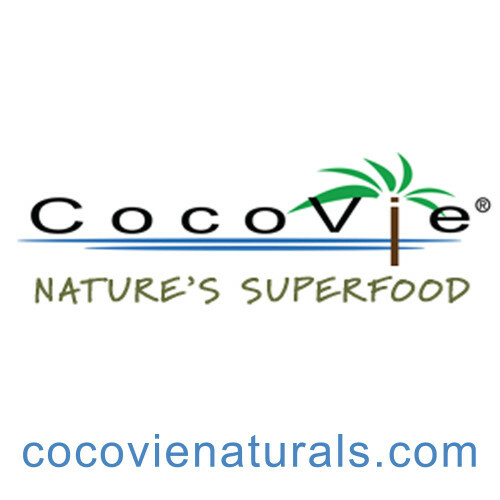 Amino acids fall into 3 categories: conditionally essential, non- essential and essential. Yes, it’s all so confusing! 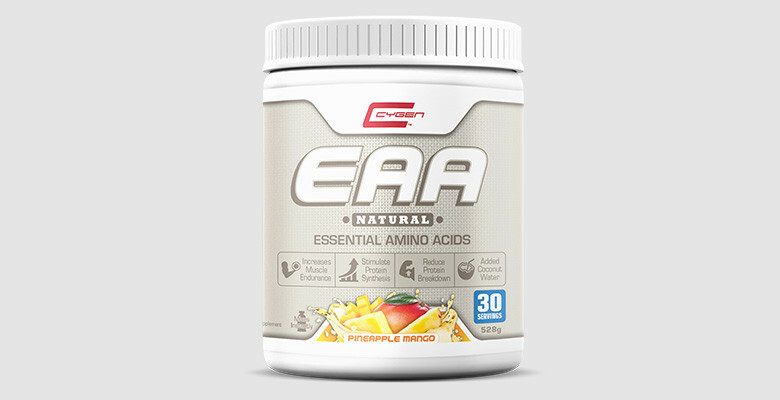 Although metabolic processes are capable of making certain amino acids, essential amino acids (EAA’s) CAN’T be manufactured in the body. They must be obtained in the diet. It’s as simple as that! Meal planning and prep can be exhausting! Eating incomplete proteins can result in amino acid deficiencies at the cellular level. Vegetarian and Vegan athletes are especially prone. Luckily, CYGEN has done it “Natural” again! Each 15 gram scoop contains 8 EAA’s, coupled with 3:1:1 ration of BCAA’s and topped off with Beta Alanine. Let me break it down more! Listed below are top reasons YOU should be supplementing with EAA’s. The first three aminos: leucine, isoleucine and valine have standing gym status. These are Branched Chain Amino Acids. (BCCA’s). Muscle building, recovery, loss prevention and blood sugar regulation help pave the road to training goal success. Lysine: Over training can weaken the immune system. One sign is cold sores! Lysine helps control herpes virus. It also aids calcium absorption, muscle building and recovery. Threonine supports the production of connective tissue while helping maintain bone and liver health. Histidine helps form and repair tissue. Red Blood cells receive a helping hand from Histidine. Strong red blood cells carry oxygen! Extra oxygen equals extra training energy! Methionine helps break down fats while acting as a powerful anti-oxidant. It’s an important part of the detoxification process. It plays a significant role in relieving or preventing fatigue. Phenylalnine improves moods, suppresses hunger and helps decrease pain. It also helps transmit signals from the brain. It’s interesting to note, phenylalanine converts to tyrosine, using iron. Women in their forties, suffering from uterine fibroids, experience heavy periods or those suffering from iron deficiency will benefit greatly from phenylalnine. These cases in particular can’t make tyrosine. It may lead to compromised thyroid function. Thyroid is key to metabolism or rate we burn calories. Cygen includes Beta Alanine in their amazing blend of EAA’s. Beta Alanine helps buffer lactic acid in active muscle. Delaying onset fatigue improves endurance and performance! By simply adding a scoop of CYGEN’s EAA’s to shakes, water or juice daily, body benefits will follow! Smoothies, juicing and fasting are a popular way to detox as well as lose or maintain weight! Raw vegetables, fruit and herbs quickly saturate cells with vitamins, minerals and phytonutrients but EAA’s are no where to be found. Thrive alive and flavor boost by adding Pineapple Mango or Fruitpunch EAA’s by CYGEN. Supplementing with EAA’s is a simple way to increase endurance and performance. Essential amino acids speed up recovery by aiding in muscle repair so everyday is a gym day!